Large infrastructure projects have become increasingly complex over recent decades. Projects in all countries are ever more international in nature; they are rarely "local", involving consultants, engineering companies, technology specialists and financing from other countries, often other continents. Government departments and the private sector in the emerging market economies not only have to initiate and manage projects that are beyond their previous experience, they also have to become familiar at a working level with international best practice. This is necessary in the first place to attract the participation of international partners, and secondly to implement and manage projects effectively. The conventional approach to infrastructure development is inadequate and falls short of enabling governments to tackle their enormous infrastructure challenges effectively. CIID has developed a four-fold approach to assist governments and companies in facing these challenges. 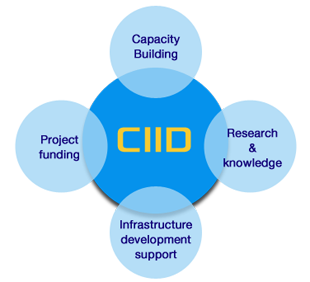 We integrate consultancy and capacity building and use knowledge and research to assist the public sector in deciding on the most effective programmes for development. Our infrastructure support systems provide joined-up support from concept stage to implementation and contract management. We have experience over a wide range of project financing structures, and can advise both the public and private sectors on the most suitable methodologies for a specific project. Most importantly, we ensure that these four elements are not dealt with in isolation, as is so often the case, but in an integrated way.